Sarah hails from the scenic Finger Lakes Region of Central New York, and has never lived less than a mile from a large body of water. Her undergrad work at the University of Vermont in Global Studies and Community & International Development led her to understand that systemic, regenerative change, in all forms, is inherently contingent upon a healthy planet and climate. 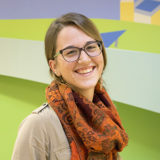 Sarah has worked in research and program coordination capacities with local Vermont nonprofits, received two Permaculture Design Certifications, and most recently worked on Senator Bernie Sanders’ 2016 presidential campaign. She is excited to join the SunCommon team in bringing a tangible, renewable energy strategy to Vermonters. When not riding the solar coaster, Sarah can often be found barefoot in a garden, hiking, enjoying live music, studying herbalism or practicing civic engagement.